Authorities have named the 11 people killed on Saturday when a man armed with three pistols and a semi-automatic assault-style rifle attacked a synagogue in Pittsburgh — the deadliest attack on Jews in the history of the United States. Officials said that the victims ranged in age from 54 to 97 and included brothers and a husband and wife. Authorities say gunman Robert Bowers, 46, made statements about genocide and killing Jewish people. The US attorney's office has charged Bowers with 29 federal counts, 11 of them for murdering victims exercising their religious beliefs. All of them are punishable by death. Bowers is scheduled to make his first court appearance Monday. State authorities have also leveled charges. At the news conference, Pittsburgh Mayor Bill Peduto referred to the rampage that took place at the Tree of Life Congregation as "an episode that will forever go down in the history of this city as one of the worst moments." "We know that we as a city, we are better than this," Peduto said. "We know hatred will never win out. That those who try to divide us because of the way we pray ... will lose." US Attorney Scott Brady said they are treating the incident as a hate crime. "This was an attack upon our neighbors and upon our friends and one that we felt very deeply," Brady said. Authorities said it will take up to a week to process the crime scene and that bullet casings were everywhere in the synagogue. Bowers' home has already been searched and they were in the process of searching his vehicle. Worshippers had gathered for a baby naming ceremony when Bowers entered the building armed with an assault rifle and three handguns. According FBI agent Robert Jones said the suspect was leaving the synagogue after about 20 minutes when he encountered Swat officers and exchanged fire with them. He then moved back inside the building in a bid to hide from police. People living nearby described the moment the attack happened. A resident of the neighbourhood, 17-year-old Cody Murphy said: "I was in bed and I heard yelling... I came downstairs and my mom was like there's a shooting at this Synagogue. "My mom was dropping off my brother and she saw some guy running down the street really fast. My brother got out of the car and the guy was like sir you need to call 911 right now." Media reports suggest Bowers was shouting "All Jews must die" as he opened fire on the congregation. According to the FBI, Bowers was not previously known to authorities prior to the attack. However, social media posts by someone with the same name were reported to be full of anti-Semitic comments. He is believed to have acted alone and his motive remains unclear. President Donald Trump described the attack as a "wicked act of mass murder", saying he would visit Pittsburgh soon. He also ordered flags on US government buildings to be flown at half mast. He called the shooting a "terrible, terrible thing", and said the US' long history of mass shootings is a "shame". "To see this happen again and again, for so many years, it's just a shame," he told reporters. Describing the gunman as a "maniac", Trump suggested the US should "stiffen up our laws of the death penalty", but said the incident had "little to do with" US gun laws. "If they had protection inside, maybe it could have been a different situation," he said. His predecessor Barack Obama voiced a different opinion, saying on Twitter: "We have to stop making it so easy for those who want to harm the innocent to get their hands on a gun." 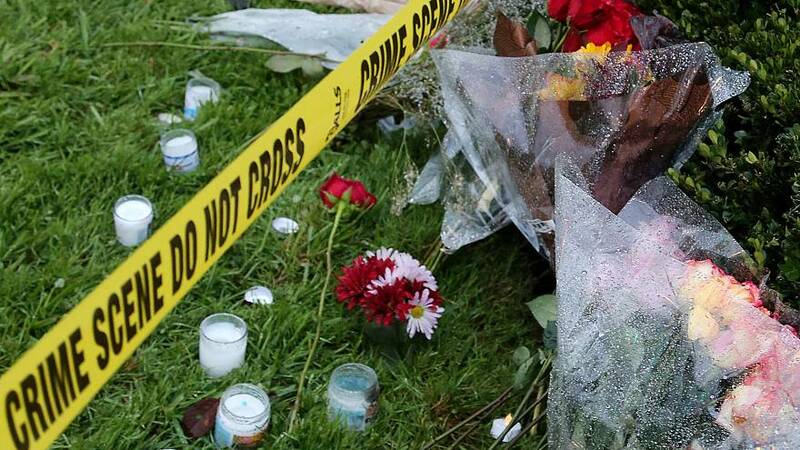 Pennsylvania Governor Tom Wolf described the shooting as an "absolute tragedy", adding that such acts of violence could not be accepted as "normal". President of the Jewish Federation of Greater Pittsburgh, Jeff Finkelstein, said his "heart goes out to all these families". Israeli Prime Minister Benjamin Netanyahu expressed grief and solidarity with the United States. "I was heartbroken and appalled by the murderous attack on a Pittsburgh synagogue today," Netanyahu said in a video message. "The entire people of Israel grieve with the families of the dead. We stand together with the Jewish community of Pittsburgh. We stand together with the American people in the face of this horrendous antisemitic brutality."